That means we get more sun than 99.97% of Americans. Click the buttons below to learn how you can put that sunshine to work. How can we utilize the sunshine in this state? Think about it. The answer to the question “Why solar?” has always been right in front of us. The earth and everything in it is powered by the sun. Shouldn’t it power our homes? Addy Solar & Electric introduced the solar solution to the Redding area in 2012. Since then, we’ve installed hundreds of systems across Northern California as more people have started using sunlight the way it was designed–to power your life. Over the past seven years, Addy Solar & Electric has expanded from the Redding area into Red Bluff, Weed, and the East Bay. Our custom-designed solar systems have become known for being the best in the business, whether you’re a residential or commercial client. We partner with brands like LG, Panasonic, and SolarEdge to bring you state of the art technology and the assurance of excellence. 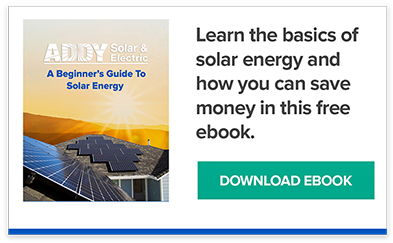 Let us show you why Addy has become a trusted name in the solar industry.